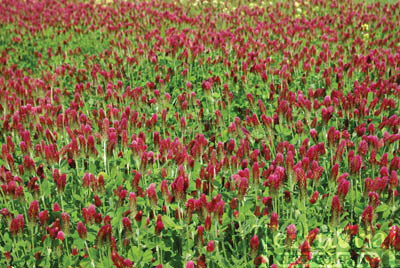 Crimson clover - a useful cover crop with vibrant red flowers in June. Photo courtesy of Territorial Seed Co. Covers crops (also known as "green manure") are used extensively by organic farmers as a relatively inexpensive way to enhance soil tilth, enrich soil with nutrients and organic matter, and protect soil in winter from torrential winter rains. Cover crops can include grains, grasses, and legumes that grow during fall and winter and are plowed, spaded, or tilled under in spring. While growing during the winter, cover crops help reduce soil compaction and prevent erosion. Their roots penetrate and loosen heavy-textured soils, allowing better air and water penetration. Deeply-rooted cover crop plants can even break up heavily-compacted soil, helping break up layers of soil that and greatly improving soil tilth, particularly when planted for several successive years. Inoculated legume cover crops can add nitrogen to the soil. And when turned under, they add organic matter to the soil—building better soil structure and fertility. So make like a farmer and try cover crops in your home garden this fall. It's easy to plant cover crops, fun to watch them grow and the only "nit-picky" part comes in spring, when you must chop them down and leave them to rot at the right time in spring. Fava bean – can be planted as late as early November west of the Cascades. - Dig your soil to a depth of about 6 inches. - Keep seeded area watered until the autumn rains take over. - In late spring (usually in June), watch for plants to begin flowering. Ten days too early and you may not achieve maximum soil improvement; ten days too late and the stems turn woody and their nutritional value is diminished. When the time comes, either spade the whole plant - tops and roots - under, or chop off tops and compost elsewhere, spading over roots to decompose for about three weeks prior to planting. Be sure to chop and turn plants right before or when they flower - before they go to seed - to prevent them from turning woody and becoming difficult to chop up. Chop them in before they produce seeds so they don't become weeds in your garden in the future. To learn more about good cover crop options, read this OSU publication titled Plant Cover Crops to Protect and Nourish Soil. From there, you can link to a pdf titled "Cover Crops for Home Gardens" (FS 304-e), which provides a little more detail on species to plant and how. Naomi's Organic Farm Supply, the Urban Farm Store, Territorial Seed Co. and many other local retail plant nurseries sell cover crops.